The Vault is so excited to be bringing on Dip nails! Dip powder is the newest nail technique on the market, rivaling gel and acrylic manicures in longevity and versatility; you can think of it as the happy medium between those two. Dip powder is the best of both worlds – it will last like an acrylic, but removes like a gel polish, but doesn’t need a light to cure and is predominately less abrasive than traditional acrylic nails. Many women get 3, 4 or even 5 weeks of wear from Dip powder and redo their manicure more because of the growth of their nail than any other reason. Dip powder allows you the flexibility of being able to grow out your thin, brittle nails while still protecting them, and have them look amazing. Using the Dip Powder allows there to be an extra layer of protection on top of your nail to prevent further breakage and allow the natural nail to grow without fear of breaking from opening a soda can. Not only is it great to use on natural nails, it is significantly less likely to chip or peel than gel polish. Most Dip powder is formulated without harsh chemicals, has added vitamins to help strengthen your nails, and won’t damage the nail bed. There is no need for monomer, since the system is applied with a series of adhesive-like glazes. 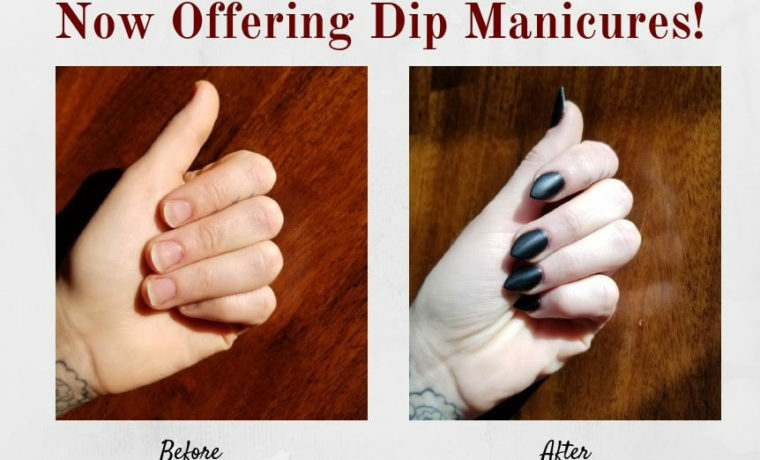 Although the Dip powder application requires a few more steps than a traditional gel or acrylic manicure, it can be done in the same amount of time in a salon. Gel manicures were once a staple in everyone’s nail routine, but it seems that Dip powder has made its move for the top of the totem pole. The real question consumers are asking is, what’s the difference? While both gel and Dip powder offer a flexible and more natural feel than acrylic, they are very different. Dip powder is odor free, both the powder itself and the adhesive-like glazes used during the application process. While gel polishes are similar in their natural look and feel, the polishes give off an odor that is hard to miss. One of the more popular differences between gel and Dip powder is that Dip powder requires no curing under an LED or UV lamp which speeds up the process of your manicure. Gel polish is wet to the touch and requires minutes of curing to harden while Dip powder air dries and hardens to an acrylic-like feel after application of the top coat. With their many differences, gel and Dip powder do share a few similarities as well. Most consumers prefer gel to acrylic because of the simple removal process and Dip powder is the same. Some other attractive properties that gel and Dip share are a long-lasting shine and comfortable and quick application. Another thing to keep in mind is that dip powders are not that far off from acrylic and gel. Because dip powders are made up of grains of pigment, they have more intense colors. This is different from acrylic nails that involve a liquid and a powder that bond to form a gel. Like acrylics, gel manicures are also a liquid that hardens when it comes into contact with a UV light. And with Dip powders, a manicurist will use a glue that contains cyanoacrylate to get it to stick on the nail. Like acrylics, tips can also be added to Dip manicures to extend the length of your nail. If your natural nails are short, and you want a quick way to add length then Dip manicures may be the choice for you! If you are interested in booking, please contact us by phone at 563-322-1063.